To paraphrase Robert Frost, something there is that does not like a consumer loan. Indeed, for a long time the idea of such credit created a sensation of discomfort, insecurity and even shame. Americans harbored a natural hostility to such practices since they tend to ensnare the buyer into schemes that are onerous. Being in debt had the stigma of indicating a lack of self-restraint and character. This attitude toward debt long dominated. But, beginning in the early twentieth century, popular resistance to consumer credit gradually diminished. Lendol Calder’s Financing the American Dream: A Cultural History of Consumer Credit is a fascinating chronicle of how this hostility was overcome. His analysis covering the late-nineteenth century to the Great Depression provides insight into a consumer culture that has led us to the present plight of an economy built upon and sustained by debt. It is a story that is not only about loans but about money, social attitudes and relationships. With the Industrial Revolution, the concept of money itself evolved. The world moved from a more personal relationship-based economy to today’s impersonal money economy. Banking shifted from a conservative commercial institution catering to industry to a more consumer-oriented business dedicated to financing the American Dream. Government’s role increased as it became involved in expanding and guaranteeing money supply and offering its own credit schemes. Starting with sewing machines, farm machinery and automobiles, the practice soon embraced almost every line of purchase including clothing. It created the tension of providing instant gratification while imposing severe discipline upon the worker now saddled with regular monthly payments. 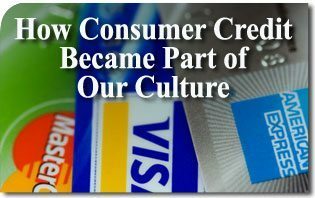 In this way, consumer debt became a permanent fixture if not an entitlement in American society. If installment buying was the instrument, credit marketing was the process which changed the mentality of thrifty Americans and secured the acceptance of consumer credit. Much more important than engineering a financial infrastructure, it became necessary to “sanitize” the concept of debt itself as a positive value for progress and society. Amply documented in Calder’s narrative, credit marketers soon found ways of reassuring the public that consumer debt was positive. The small-loan lenders were no longer “loan sharks” but found new identities as “financial advisors,” “financial doctors,” or “consumer counselors.” Even the installment plan itself underwent a facelift as they came to be called “budget plans,” “club plans,” ‘thrift accounts,” or “preferred buyer plans.” These and other subterfuges gradually turned the tide that paved the way for the credit wave of the future that continues to the present. Today’s credit-card economy runs on “more.” There are more consumer goods, more credit devices, more profits, easier and longer terms—and more undisciplined consumers. On the surface, the quest for more happiness in consumer paradise seems to be intact although maxed out and overextended. But under the surface, this is anxiety. From the frenetic intemperance by which consumer credit has expanded, there comes a different kind of “more.” There is more instability, more stress, more future debt burden—and perhaps more unhappiness. Such sobering perspectives invite reflection on the future of the American dream bought on an installment plan. This entry was posted in TFP Recommends Books by John Horvat II. Bookmark the permalink.